There’s never a shortage of opportunities to enjoy Mother Nature in Texas. You'll find some of the best spots for hiking here due to the sheer diversity in terrain. Whether hikers want steep mountains or flat, swampy grasslands, there are plenty of beautiful places to explore with over 70 national and state parks across the state. In West Texas, Big Bend is a hiker&apos;s paradise with over 150 miles of trails. Both experienced backpackers and day hikers alike will enjoy the boundless beauty of this West Texas masterpiece. The most famous hike in Texas is the 12.6 mile South Rim trail. No other route has the grandeur and scope of this trek up the southern edge of the Chisos Mountains, and no other trail rewards hikers with such a mind-blowing view. Thousands of feet below, the Sierra Quemada badlands fade into desolate ridges on the other side of the Rio Grande. If hikers have the time, and the energy, add the 3.5-mile East Rim trail to your hike, which offers spectacular vistas of the Chihuahuan Desert. The best part? Shady forests and cool temperatures make the hike comfortable year-round. To reach the highest point in Texas, hikers can climb 3,000 feet to Guadalupe Peak at Guadalupe Mountains National Park in West Texas, which is 8,749 feet above sea level. To the north, hikers can look out over the rest of the Guadalupe Mountains, while an endless vista of rugged desert is to the south. On a clear day hikers might see the Davis Mountains 125 miles in the distance, or even all the way to the distant sierras on the other side of the border. In the Hill Country, admiring the fall foliage at Lost Maples State Park in Vanderpool is a Texas ritual, and rightly so. The park is set in a beautiful and remote part of the Hill Country on the Edwards Plateau, and is home to clear rivers, rough canyons, thickly wooded banks and stands of the park’s namesake, bigtooth maples. The trails mainly follow the pristine Sabinal River and its tributaries, with long flat stretches and short but rapid changes in elevation. Wildlife is abundant, and hikers have been known to see rarities like the green kingfisher or one of the red-tailed hawks that nest on cliff faces in the park. The route is primarily shaded by a canopy of tree limbs, making the sudden panorama of the surrounding country from the West Trail above Mystic Canyon even more dramatic. Considered the second largest canyon in the United States in the panhandle town of Canyon, Palo Duro Canyon is steeped in history and boasts more than 30 miles of hiking trails that leave hikers breathless, both from the challenging hike and the beautiful views. The “Grand Canyon of Texas” stretches for 120 miles through rugged and arid terrain. The six mile Lighthouse Trail leads hikers to the most famous formation in the park. The trail is roughly 6 miles long and winds through the canyon to the Lighthouse, a towering pillar of rock that rises above the park and dominates the surrounding landscape. Additionally, hikers can walk along the Juniper/Cliffside trail to see caves that were carved into the cliffs by moving water, and spot horned lizards while walking to the river and back on the Pioneer Nature Trail. The 11 mile Givens, Spicer & Lowry Running Trail is the longest route in the park and winds across badlands and canyons with a few short, steep climbs. 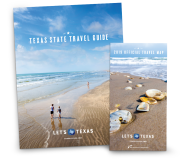 For those interested in exploring two thousand acres of dunes, marshlands and the diverse ecologies of the shoreline, head to Galveston Island State Park. The park’s many trails meander through the bay-side, where coastal prairies meet tidal wetlands and narrow bayous reach salt meadows dotted with freshwater ponds. Salty sloughs and oak motts provide cover for wildlife from coyotes to turtles, and the park is a bird-watcher and photographer’s paradise. From high peaks to coastal prairies, there's a trail waiting for you to explore here. Grab your backpack, water bottles and hiking shoes, because Texas’ trails are calling your name.